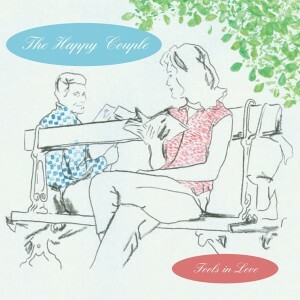 The first German act on Matinée, The Happy Couple live in Hamburg and also run the excellent Félicité Singles Club record label. A follow-up to their sold out debut single, the 'Fools in Love' EP is an instant classic incorporating all the right influences but with a thoroughly modern sound. Lead track 'Another Sunny Day' is an immediate pop hit sounding nothing like the band of the same name but perhaps a little bit like Sarah labelmates Even As We Speak. 'Hopeless Case' and 'The Pop Kid' turn up the guitars a notch for two potential indie club hits that could double as long lost Shop Assistants gems, while 'Don't Call It' is a hypnotic song that recalls classic recordings from Marine Girls or Revolving Paint Dream. The single was masterfully produced by Ulric Kennedy (The Golden Dawn, The Catalysts, The Void, The Mixers) and Dannie Vallely (The Void, The Catalysts) who helped provide a bright glossy finish to the four songs. Fans of the abovementioned bands or current indie stars Pipas, Tender Trap or Club 8 take notice! Limited to 1000 copies in custom minijacket sleeve.